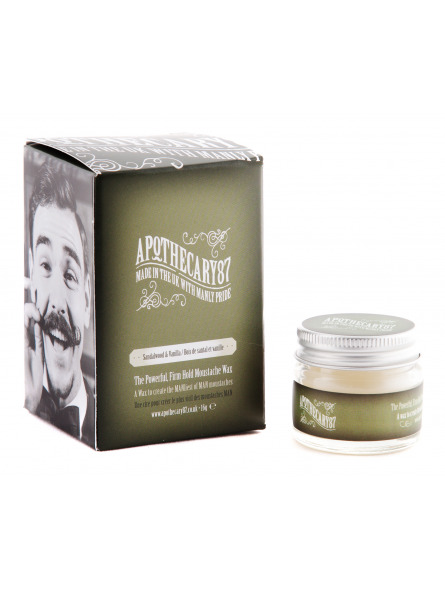 Apothecary87 The Powerful Moustache Wax 15ml. A wax to create the manliest of man moustaches. Manly benefits: The powerful firm hold moustache wax has been developed to have a strong hold for styling your droopy looking moustache. We understand that since your nose has been positioned above your lip fur, it should smell like the man you are, and as a result, we have used only our manliest of smell combinations! We have even added some of our moustache softening oils to help your moustache shape more easily over time. Directions of manly use: Using the back of your manly nail, scrape out a small bead of wax and work it between your thumb and forefinger until it starts to melt (you could also use a hair dryer if you have one handy to melt the wax in the jar). 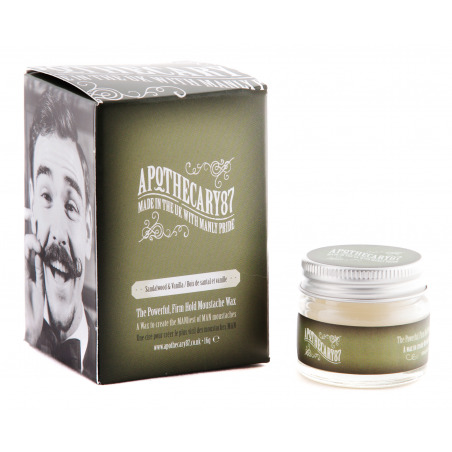 Gently work the wax through your manly moustache and style it to unleash a powerful man. Keeping the wax in your pocket will keep it warm from your body and allow easy use.